Trip two was triumphantly underway, and the weather outlook was sunny and warm. As a group, we were determined not to fall victim to our trip one fallacy, which included Sysco sponsored Mexican food in Roscoe, New York and plenty of road side diners. We were ready to eat proper meals on our brigade through New York State. If trip one was marked by famine, our steadfast dedication created a rebound experience marked by feast—perhaps gluttony. 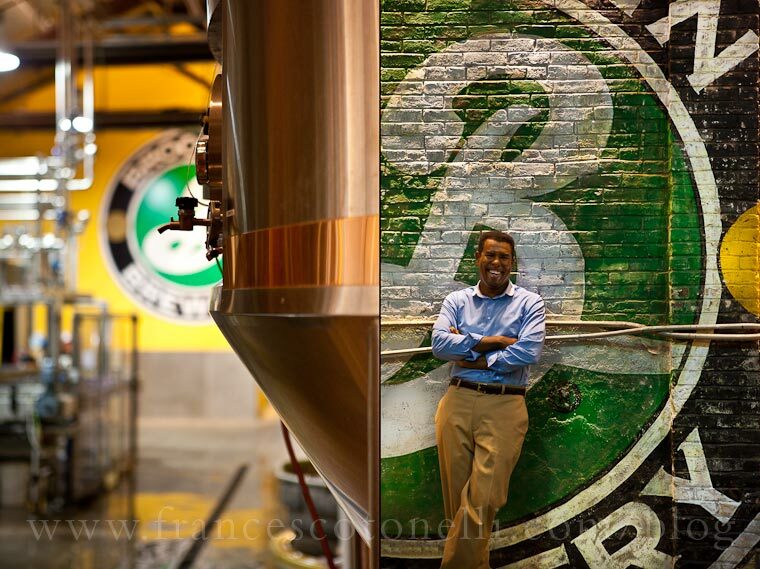 Before we even left for Long Island’s shores, we met brew master extraordinaire Garrett Oliver at his home base in Williamsburg, Brooklyn. After touring his stamping ground, Garrett joined us for pizzas, plates of antipasti, and pints of Sorachi Ace. Satisfyingly satiated, we bid farewell and made our way to dig for clams in Southampton with fifth generation bayman Ed Warner. His title expresses a broad range of expertise—scalloping and setting conch pots to name a few—so don’t think about calling him a ‘fisherman.’ Effortlessly he rakes in the brackish water of Springs Pond, knowing exactly where to look for his beloved bi-valve. Later that evening we ventured to the far reaches of Long Island to Greenport Harbor. Here we met Mike Osinski of Widow’s Hole Oyster Company. What does an Oyster farm look like? In this case it exists 500 feet from the shore in Mike’s backyard. This is bottom that Mike annexed upon buying his waterfront home. The sun began to dramatically set over Shelter Island, and Mike offered to host us for dinner—score! Oysters were the star of the meal: shucked minutes from being excavated from the water. The next morning at 5:00 a.m., we continued our nautical theme by fluke fishing off the coast of Amagansett with two colorful baymen—Billy and Danny. Watching them fish using a Native American pound trap technique was captivating: large wooden leader poles direct retreating fluke into a set of netted traps. Here the fish swim around until the two men scoop them into their boat. These traps were filled with 10,000 pounds of fluke and local porgies, making for a bountiful catch. The morning was cool and we soaked in the salty sea air. Ah, good morning Long Island! Feeling invigorated, our troop had a three hour drive back through the City and up-state to the Hudson Valley. Now, the dining precedent had been set—what would be our next indulgence? Determining that a minor detour would take us to New Jersey, Chef Daniel invited us to his abode. What resulted on the table was a restaurant worthy spread: insalta caprese with beautiful heirloom tomatoes and hand pulled mozzarella, rustic salami and soppressata, prosciutto, and loaves of crusty baguette. The setting was beautiful, and even more so when wine was pulled: 1999 Dom Perignon and 1998 Giuseppe Quintarelli Rosso ca' del Merlo. The evening ended at Sycamore Farms grilling their fresh picked corn and local red onions. As the adventure continues, we are truly amassing a worthy collection of New York State products while meeting the passionate practioners who grow/catch/create/cook them. Necessarily, we seek inspiration everywhere to collect great stories and capture beautiful light. We even go to work for the sake of shot. Bryce and I simultaneously harvested berries and weeded along side Franca Tantillo—bringing Francesco's perfect image into fruition. Occasionally, we are also humbled by the sheer force of nature—reminded upon coming face-to-face with Mr. Right, the 2,700 lbs. bull at Rosenkrans beef farm. I speak for myself (although I believe my colleagues will agree), that this year I have never been more in-tune with seasonality and the weather elements that affect it. We are farming along side our subjects, although our harvest is fulfilled in the form of their stories.